Make way for the positive day during Winter Music Conference with "One Love" celebration of live performances, art and food for charity. A jam-packed cavalcade under the stars at North Beach Bandshell, an evening of peace, love & unity. Patrons will come together to donate food -- minimum of 2 non-perishable items to the less fortunate, as part of the admission to the annual Miami Reggae Festival on Miami Beach. Miami Beach, FL, January 11, 2019 --(PR.com)-- Miami Reggae Festival fuses food, arts and reggae to raise awareness about extreme poverty on Friday, March 15, 2019 during the Winter Music Conference on Miami Beach for a powerful night of reverence, livity, peace and unity - expanding consciousness through music, food and charity. "Reggae music, a music now recognized as world heritage music by UNESCO (The United Nations Educational, Scientific and Cultural Organization) brings together people from all walks of life in the spirit of oneness for an evening of sharing in culture and healing," says founder Alfonso D'Niscio Brooks. Miami Reggae Festival expresses the hopes and dreams of a world in which that what is in common is far greater than that which divides. Through the Festival, people live not by looking at each other but by looking together in the same direction. The festival unifies Miami’s diverse community at this event to aid Dade County residents living in poverty. Music has always had the power to unite and inspire humanitarianism. The Miami Reggae Festival takes it to the top, offering the highest quality of performance, socio-political ambience and service to community available anywhere. Past festivals featured the likes of: Stephen and Damian Marley, Bunny Wailer, Steel Pulse, Toots & The Maytals, Cultura Profética, Morgan Heritage, Midnite, Gondwana, Natiruts, Tiken Jah Fakoly and Luciano to name a few. This year, the Miami Reggae Festival is headlined by the legendary Roots band from St. Croix Akae Beka (formerly Midnite), Akae Beka is the current manifestation of an evolving consciousness. As the Book says: "Much like the archangel Michael who was responsible for the truths pertaining to the secrets of creation," so does lead singer Vaughn Benjamin today accept his role in a parallel time of rampant deception and broken taboos in the arenas of world leadership. Always rooted firmly in the teachings of His Imperial Majesty, Emperor Haile Selassie I, he said "my personal evolution and reaffirmed purpose is manifested in this newly declared name from the Book of Enoch: Akae Beka, a sacred oath described therein, the Akae, the Beka, one and the same." Also performing from Jamaica, Jah9 and the Dub Treatment, deeply mystical, Jah9 has emerged from a chrysalis of poetry, dub and spirit to become a powerful feminine energy within a universal grassroots movement of consciousness. Inspired by the open spaces in the instrumental dub of 1970’s Jamaican roots music, Jah9 sings with a voice that belies the dimensions of her physical body, from a soul much older than its current vessel; “reminiscent of that darkly operatic wailer for truth & justice, Nina Simone.” Her philosophy-profoundly spiritual, and her style–Jazz on Dub. Miami based Rhythm Flow, zen trance dub will pulse through the crowd, raising the vibration as Colombian Zurich Based DJ Nurstacris maintains the positive vibes throughout the night. Continuing the tradition of collecting non-perishable food items to distribute to those in need, the Miami Reggae Festival partners with Miami charity Hecho en Casa, Visual art displayed echoes sentiments felt throughout the human experience and plant-based and cruelty-free dishes complement the compassionate atmosphere. Miami Reggae Festival has also joined the rally to raise awareness about the positive impact and benefits of the gift cannabis, the plant for the mind, body and spirit. In the spirit of unity the Miami Reggae Festival producers found it necessary to be a part of this rally. In the challenging economic climate today, it is known now more than ever the need for a positive vibration. As the legendary Bob Marley said: "Herb is the healing of the nation." Join in a day of good vibes and let's get together and feel alright. 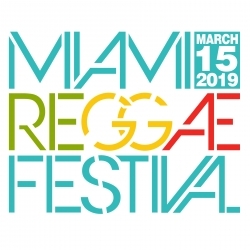 Miami Reggae Festival takes place on Friday, March 15, 2019 from 5-11pm at the North Beach Bandshell, 7275 Collins Ave. Miami Beach, FL 33141. Tickets are $22 in advance plus two non-perishable food items for entry. Miami Reggae Festival is family-friendly, children under 12 are free when accompanied by an adult.